“Melanie was able to articulate the underlying dynamics that make working in health care so miserable. She put words to what I sensed but didn’t understand.”—P.W., Nurse While we plan to solicit endorsements, we do not have any to add to date. Melanie Sears, RN, MBA, PhD, has been a CNVC certified trainer since 1991. She works with businesses, hospitals, nursing homes, hospices, individuals, couples, and parents in transforming communication and interactions to ones that are more compassionate, conscious, and effective. 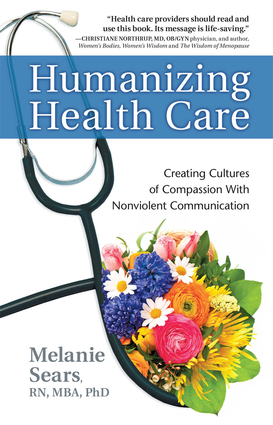 Melanie presents Nonviolent Communication at conventions, at universities, and at churches. She has been interviewed on the radio and on television, and is the author of several titles, including the workbook Choose Your Words: Harnessing the Power of Compassionate Communication to Heal and Connect available at www.dnadialogues.com. Her presentations have been described as exciting, inspiring, educational, and transformative. Melanie says, "Everything is about communications. Any problem can be resolved within minutes when negative energy is transformed into caring connections." Melanie has worked in most areas of health care as a Registered Nurse (RN), administrator, and supervisor for more than twenty-five years. She has observed common communication themes in each area she experienced. These themes adversely affected both patient and staff satisfaction, which resulted in increased operating costs, increased staff turnover, increased sick leave, and, in general, poor teamwork and lack of harmony. Melanie discovered that by shifting the communication patterns used, everything else shifted to create more positive outcomes for staff, patients, and administration. Melanie lives in a cohousing community in Seattle, Washington, close to her granddaughter. She retired from nursing in 2016 and now enjoys her days doing whatever she wants.